"I have just returned from the concert given by Chopin, that artist whom I heard playing when he was seven... How beautifully he plays today! He plays with such certainty, so cleanly... no ambiguity, nothing false... no pretensions. His music is full of expressive feeling and song, and puts the listener into a state of subtle rapture". Another listener perceptively observed that "His gayest melodies are tinged with a certain melancholy by the power of which he draws the listener along with him." Chopins fame soon spread well beyond his native Poland, and he was not yet 20 when he began to feel the need to travel and broaden his horizons. In the autumn of 1830 he began an extended journey across Europe, destined never to see his Polish homeland again. He arrived in Paris in the autumn of 1831. At this time Paris was the cultural capital of Europe, the most modern, most cosmopolitan city of the age. From the start, Chopin's charm and genius won him many friends among Paris musicians, but with so many pianists competing for work he found it difficult to make a living. He was considering trying his luck in America when a chance meeting resulted in his introduction to the wealthy and influential Rothschild family; through their patronage he gained entry into the numerous private salons of fashionable Paris society, which he found an ideal environment for playing his music. As wealthy aristocratic families began to send their daughters to him for piano lessons, he could at last earn a decent living, and Paris became his home for the rest of his life. In the autumn of 1836 Chopin first met the woman who was to change his life, Aurore Dudevant (better known by her novelist pseudonym George Sand). By 1838 their friendship had ripened into love. The couple honeymooned in Majorca, spending the winter of 1838/9 living in a disused Carthusian monastery at Valldemosa. For the next eight years Chopin's life followed a more or less regular pattern of teaching the piano in Paris in the winter and composing in the summer at Nohant, George Sand's country retreat some 180 miles south of Paris. It was here in the tranquil setting of the Berry countryside that Chopin wrote some of his best-loved music. The summer of 1846 was the last that Chopin spent at Nohant. In 1847 his relationship with George Sand came to an abrupt end when family quarrels involving George Sands two children from her previous marriage led to a rancorous split between the former lovers. Chopin never really recovered. His creativity was stifled, and his health deteriorated rapidly, taking its toll on his teaching and hence on his livelihood. Political violence on the streets of Paris forced him to seek temporary refuge abroad, still only 38 years old but with no source of income and dying of consumption. His devoted Scottish pupil, Jane Stirling, persuaded him to visit Britain, and despite an exhausting whirl of social engagements and the suffocating but well-meant attentions of Jane Stirling and her sister, he managed to give concerts in Manchester, Glasgow and Edinburgh  an astonishing feat for a man so close to death. His last public appearance took place in London at the old Guildhall on 16th November 1848. The occasion was a concert and ball in aid of Polish refugees. Chopin played several of his shorter pieces on an upright piano in a side-room adjoining the main hall. According to his pupil, Princess Marcelina Czartoryska, "Chopin played like an angel". By now completely exhausted, Chopin was greatly relieved to return to Paris, where he spent the last months of his life virtually bedridden, supported by the generosity of his friends and pupils. Shortly before his death his sister Louise made the long and arduous journey from Warsaw to be with her brother for his last remaining weeks. 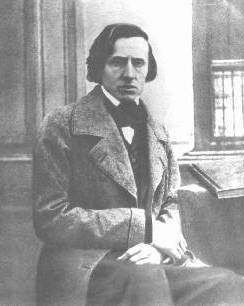 Chopin finally gave up the struggle and died on 17th October 1849, at the age of only 39. On his tombstone in the beautiful P�re Lachaise cemetery in Paris is the simple and moving inscription: "To Chopin, from his friends". Now, 150 years later, Chopins friends number in millions as his incomparable music continues to reach out to and move audiences across the world. Hear Jack Gibbons performing some of Chopin's greatest works at Oxford's historic Holywell Music Room. Situated in the heart of the beautiful university city of Oxford, England, the Holywell Music Room is Europe's oldest purpose built concert hall. Details of forthcoming concerts can be found by clicking on this link to the Concerts in Oxford page.